Tuesday, 16 April 2019, 3:15p.m. 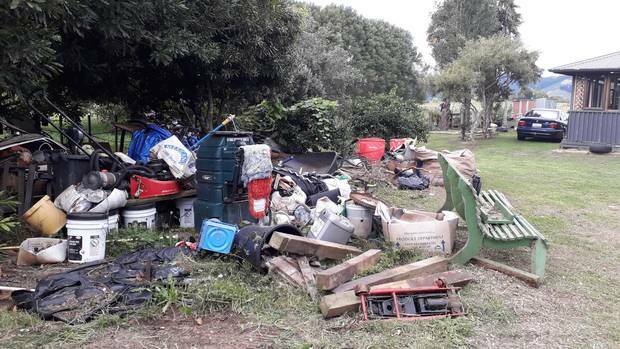 A rogue tenant has left an ageing Levin couple thousands of dollars out of pocket - and saddled with a mountain of rubbish at their property. Mohi Te Purei Parker, 82, and Piki Parker, 75, were forced to pay for multiple skip bins to cart away a mountain of rubbish scattered inside and out that had everything but a kitchen sink. Even the toilet lid was broken. The quaint lifestyle block had been a family home for the Parkers for more than 20 years, but they moved to Porirua last year and decided to rent the three-bedroom home for $250 a week. The couple said they would think twice before renting the house again. They were still chasing thousands of dollars in unpaid rent. A Tenancy Tribunal order showed they were still owed $3113 as the tenant had ceased paying rent months ago. "It's just not fair. We didn't deserve this," she said. Mohi Parker said the tenant had been a lawnmowing contractor and had brought home lawn clippings and green waste each day and scattered them all over the property during their eight-month stay. Neighbours had helped with the clean up, for which they were grateful, she said. The tribunal heard the tenant had until midnight last Tuesday to collect his belongings. The Parkers had decided once they had finished cleaning they would move back into the house themselves - and would not rent it out again. They were keen to create more happy memories.